Without a doubt, Borneo is wildlife heaven! There are beautiful animals where ever you look; Orangutans, Pygmy Elephants, Sunbears, Proboscis Monkeys, Silver Leaf Monkeys, Macaque Monkeys, Pythons, Monitor Lizards and Sea Turtles – just to name a few. Unfortunately with so much beauty, also comes extreme human destruction. There are many instances where native animals are harmed and killed due to various reasons in this country, resulting in habitat loss, confinement and torture. Although it may seem as though man is destroying the earth and the animals of our planet at a rapid rate, we can’t ignore the beautiful rehabilitation centres that want nothing more than to keep the native animals from becoming a distant memory. There are a lot of incredible organisations in Borneo, and here are some that you mustn’t forget! 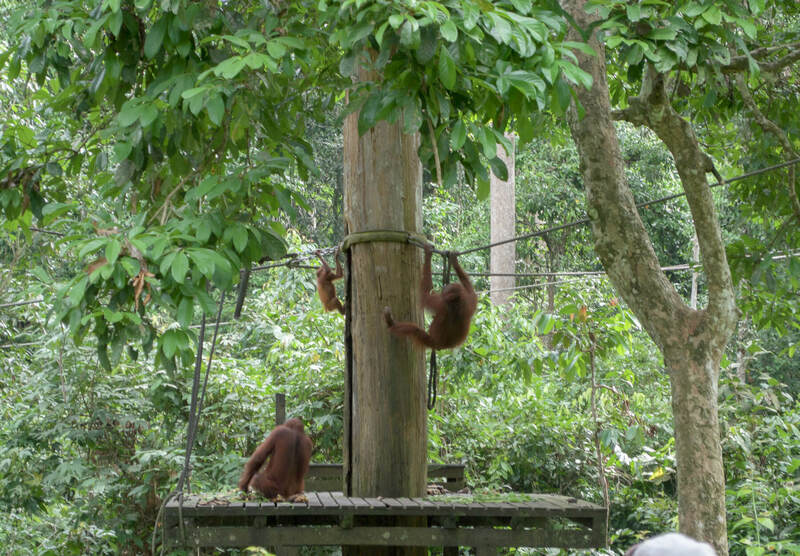 Without a doubt, I firmly believe that Orangutan encounters in Borneo are best done in the wild, but this rehab centre is also an incredible alternative! The Orangutan Rehab Centre is a free to roam sanctuary; rehabilitated from habitat loss, human pets and abandoned young. The animals are not confined, they are here on their own terms for encouragement and assistance in living back in their natural environment. Human interaction in this centre is little to nothing. The aim is to rehabilitate the animal back into the wild, so the fewer the Orang-utan, the more successful the work. They are fed twice a day and are given the food on a platform for viewers to see. Spectators are to keep very quiet and are banned from using flash photography to prevent the Orang-utans from being frightened. Orangutans are found around 300m above sea level. They travel for 1-2 weeks in search of a mate and are pregnant for 245 days. Orangutans build a fresh nest every day, aside from when there is good fruit around (figs are their favourite). The nest takes around 30 minutes to build. The young stay with the mother for 6-8 years, although starting to break away at around 3 years old. During this time the young lives quite close to Mum, coming back for support and protection when needed. The Orangutan is 7 X stronger than human beings. The lifespan is 35 – 45 years. Here at Sepilok Rehabilitation centre, the main goal is to rehabilitate the animals until their work is no longer needed. It gives the Orangutans a place to come to if need be, but by no means are they forced to stick around if they feel otherwise. It’s a beautiful centre doing an amazing job at rescuing the most iconic, endangered animal from extinction. This is a wildlife experience that any true animal lover must put on their bucket list! These beautiful, timid creatures are so incredibly endangered; so much so that there are fewer than 1000 left in the wild. The Sun Bear Conservation Rehabilitation Centre in Sepilok (next door to the Orangutan Centre) rescues Malayan Sun Bears from confinement and mistreatment. Most of the bears have been rescued from being pets, locked inside cages with chains around their necks. The damage is so bad that one of the poor little guys is blind, tortured so badly and never seen the outside world, that he refuses to step out of his ‘bedroom’ due to fear. 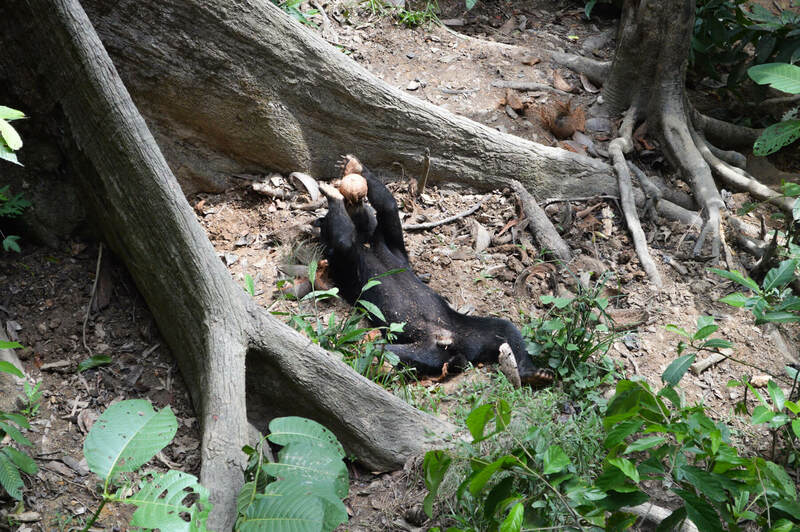 The Malayan Sun Bear can be quite shy and personalities can range from adventurous to terrified. The rehabilitation process varies depending on the bear; some taking years to progress due to such extreme torture, some may be quick, and some may live here for the rest of their lives. The only difference between this and the other centres is that these animals are enclosed. Simply so they can be monitored, as many have never lived their lives in the wild. They have the option to be inside or out, depending on their mood, but are not on display for tourists… They are here to learn how to be a bear! You also have an amazing opportunity to adopt one of the bears, which helps to fund the rehabilitation centre and the process needed to make the 35 rescued bears live a beautiful life! I, of course, could not help myself and adopted a little guy called ‘Rungus’. 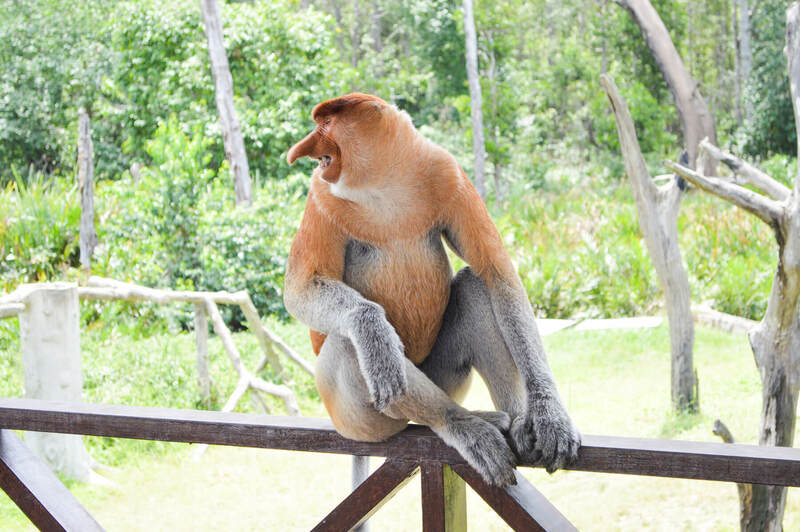 The Proboscis monkey sanctuary is a real eye-opener. The hundreds and hundreds of monkeys that you see here are not shy by any stretch of the imagination. The sanctuary was created due to the extreme habitat loss surrounding the area that the monkeys lived in. 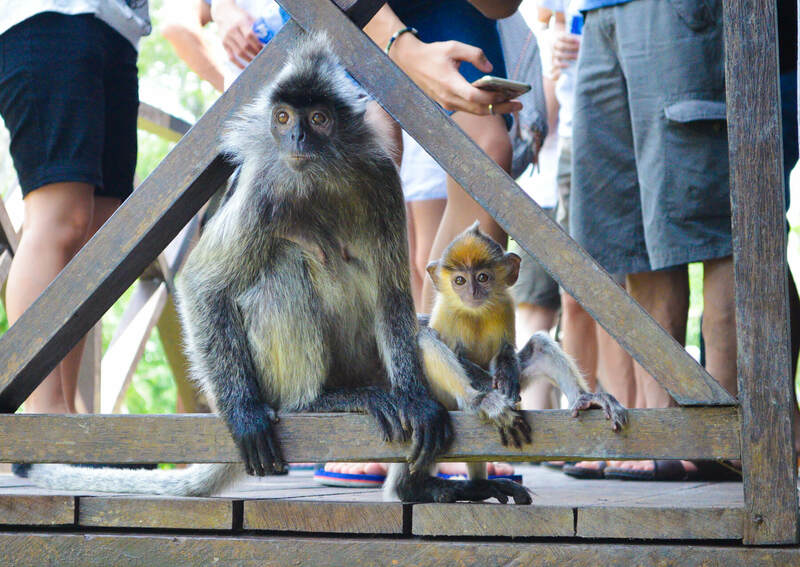 The Proboscis and Silver Leaf monkeys come to this sanctuary twice a day where they are fed and observed by tourists. There is no enclosure, these monkeys are here on their own accord. The human interaction these monkeys face is quite intense. To be completely honest, to me this place is nothing more than a tourist attraction. At first, I was quite confused on whether I was a fan or not, although the more I think about it the more I am okay with it. These monkeys are not confined, they don’t have a chain around their neck and they aren’t stuck in a cage. They are still 100% wild but have a human interaction that would be completely unnatural to them if the sanctuary wasn’t there. The place is completely surrounded by palm oil plantations, so when you’re looking at the monkeys, you’re on the edge of the jungle… But turn your back and there are kilometres of damaging palm oil. I guess I just wish that these kinds of places did not need to exist. Human destruction of wildlife is so severe in Sabah that these particular groups of monkeys would not be alive today if it weren’t for sanctuaries such as this. So I guess I am thankful for this place. I am devastated that it has gotten to this point, and that mans destruction is now making a profit, but I am also thankful that there is no harm or mistreatment of the animals themselves. They are being fed, I guess that’s not all that bad hey? Wildlife is basically suffering, but thankfully there are many beautiful places to rescue and rehabilitate the native Bornean animals from such ruination. Spending a day with the Orangutans and Sun Bears at these rehabilitation centres really showed me that there are people who care about the natural environment and the animals that live in it. There are good people and these places will show you nothing but that!